Buy, Rent or Skip Jaws ? With the big release today for Jaws on Blu ray, I thought it was only fitting that I'd bust out my Anniversary Collector's Edition. Actually, it's been sitting right by my TV for the last couple of months, waiting for the right momemt to play it and now was as good a time as any. I won't get into the merits of the film or Steven Spielberg here. It's already been done a million times over and there will plenty more where that come from now that the Blu-ray is out. I'll just tell ya how profound the movie itself was on me as a kid. 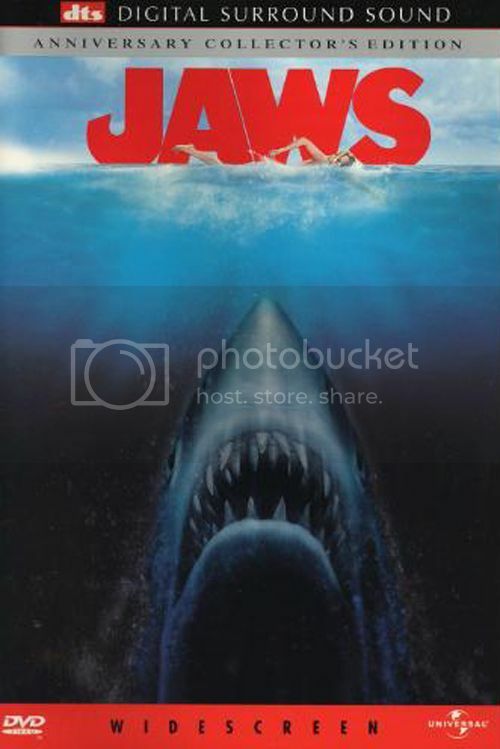 I remember the first time I saw Jaws at The Roxy Theater in my home town. I remember that night like it was yesterday. I remember the electricity of the crowd as we waited to go in and I damn well remember how much the movie scared the s h i t out of me and how terrified I was walking out of the lobby out into the street. This movie seriously f u c k e d me up. So much so that I would not go swimming in the ocean for 10 years after the fact. F u c k you Spielberg! Even though I would eventually conquer that fear of mine and get back out into the water and start surfing, this movie is never far away from my mind, especially if I am body surfing or sitting on a board. I may be getting older, but when I'm out in the water, I still feel that little kid in me. I may have been just a tyke when this movie came out, but I knew that I had witnessed something amazing an epic film. I didn't know anything about "Directors" at the time. But this movie made me sit up and take notice and I came to learn about one Mr. Spielberg. Since then I have followed each and every movie he has done and I was damn excited about his next release (Close Encounters). Jaws was also the first film where I actually started tracking what a movie made financially. It was hard to escape back then because a lot was made about it and I bought into it. This movie is so good on so many levels. Roy Scheider as Brody may have been the star of the movie, but it was Robert Shaw as Quint that stole the movie. Even Richard Dreyfuss as Hooper was bigger than Brody in my eyes as a kid. The scene where they are sharing stories about scars and then about Quint being surround by 1000's of sharks is still a corker that ties everything up about who and what the character is. As terrifying as the ending is, I get a major thrill when Brody tells 'Bruce' to smile and he blows the s h i t outta him. Watching the movie now, I'm amazed that I even got to see Jaws when I was a kid, especially in how graphic (at the time) of the scene where 'Bruce' chomps on Quint. I thought that s h i t was real!!! I shouldn't have to say it, but I will. This is definitely a Buy, no matter what format it is. But I will triple dip for the Blu-ray eventually. No brainer on that. Who says you need a bigger boat?